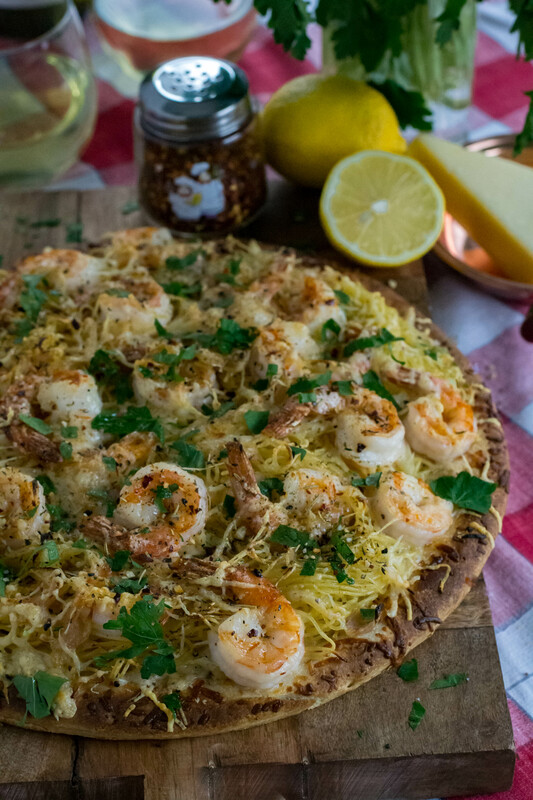 Shrimp Scampi Pizza - What the Forks for Dinner? 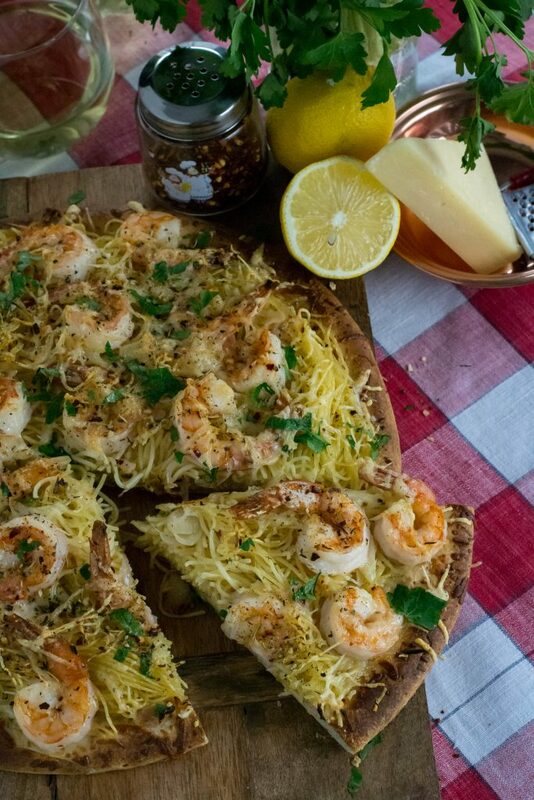 Pizza is not pizza without cheese, so mozzarella and parmesan, besides without sauce you need something on the bottom to keep the buttery goodness from the pasta from seeping into the crust and making it soggy. That is also why I chose a pre-made crust, well one of the reasons why. Pre-baking the pre-made crust gives you a crispy crust for all that pasta, and pre-made is easier, cause sometimes I’m lazy! When cooking the shrimp, only cook one side as the time under the broiler will finish cooking. Nothing is worse than rubbery over-cooked shrimp. Also be sure to keep your flame at no more than medium for the garlic and shallots, or they will turn bitter. 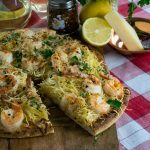 If you are looking for Valentines Day or just because you want an excellent pizza, try Shrimp Scampi Pizza and let your taste buds be amazed! Preheat oven to 450 degrees. 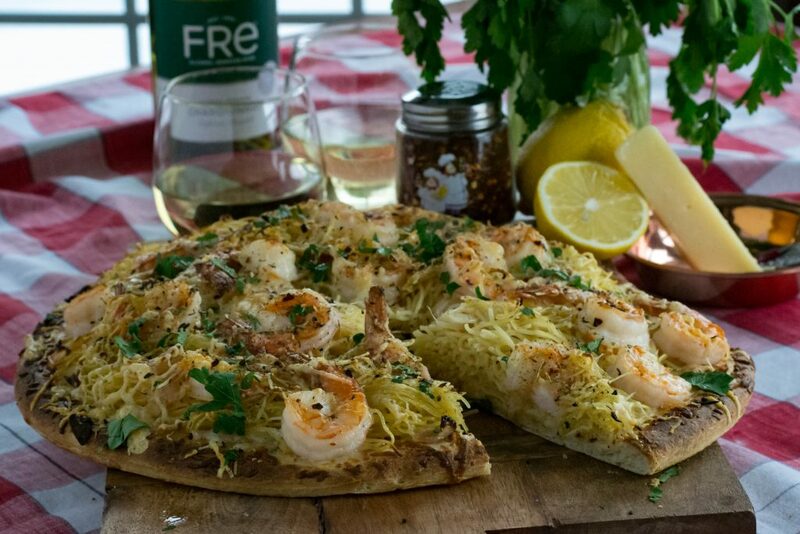 Place pizza crust on a pizza stone or cookie sheet and bake in preheated oven for 5 minutes. In a large skillet over medium heat, melt 2 tablespoons butter, and avocado oil. Add the shallots, garlic, and red pepper flakes. Saute for 1 minute. Add the shrimp and cook on one side. Once the shrimp begin to turn pink remove them from the pan to a plate or bowl and set aside. Deglaze the pan with white wine, salt and lemon juice to skillet and bring to a simmer. Add the remaining 1 tablespoon of butter. Brush the par-baked pizza crust with some of the butter-wine mixture. Be sure not to saturate the crust with butter. Place 1 cup of the shredded mozzarella on top of the pizza crust. Add the reserved pasta to the butter-wine mixture in the skillet and toss the pasta to coat. Return the shrimp to the skillet and toss. 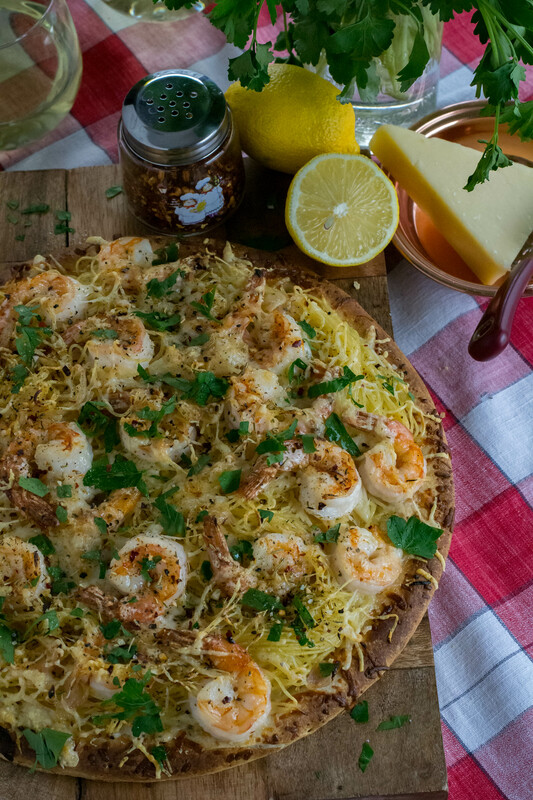 Place the pasta shrimp, mixture on top of the mozzarella cheese arranging the pasta and shrimp evenly over the pizza. 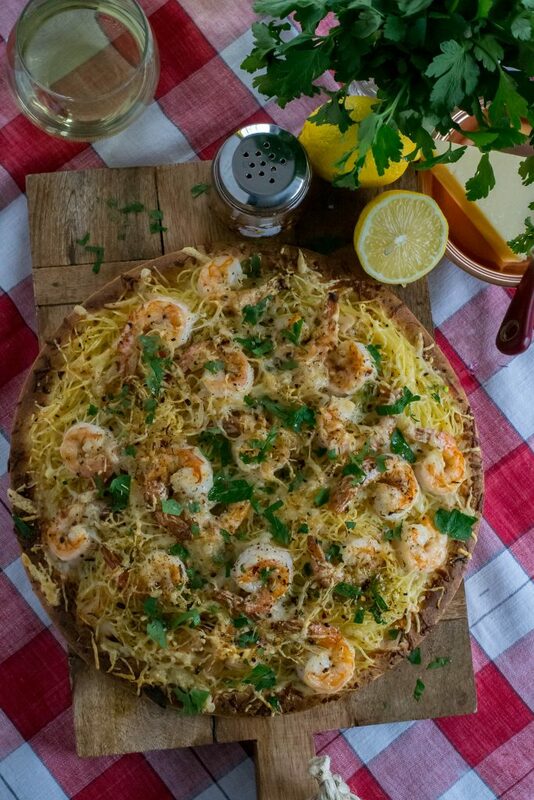 Top pizza with remaining mozzarella and parmesan cheese. Set the oven to broil and broil until the cheeses are melted and beginning to brown.